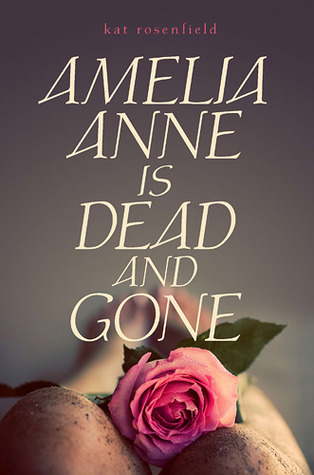 Amelia Anne is Dead and Gone by Kat Rosenfield is one of those dreary small town life blues type story where the main character, Becca, is graduating and can't wait to go off to college and dust her home town off of her heals for good. Then the body of a mysterious girl is found on the roadside and no one seems to know anything about her: who she is, where she came from and who did her in. The reader learns about Amelia Anne in short intervals tucked between the everyday happenings in Becca's summer, and as gossip and news about the mysterious girls death circulates through the tiny town, Becca loses focus on her college bound goals. She doesn't want to be absorbed by the go nowhere lifestyle of where she lives, but she can't seem to care about preparing herself for her college career anymore either. As Becca's life unravels, you find out about what happened to Amelia Anne. The lives of the two girls are supposed to parallel but I really didn't see it. The ending seemed anti-climactic and followed much of the story which really captured the feel and essence of the dead-end lifestyle of the town and its occupants. It felt like the entire story was set either at night or beneath a constantly cloudy sky. It was heavy and oppressive, and the ending didn’t succeed in lightening the mood even though the mystery surrounding Amelia Anne’s death was finally solved. The cover was an excellent choice for this novel as the sense of death and abandonment is portrayed well in the depicted dirt crusted knees and blurry bare feet with a dew drenched rose nestled in the valley between created between the legs. The dark background also adds to the shadowy tale of death and dead-end lives within this back-water town. I don't remember hearing of this one. The cover is interesting and it sounds like it goes well with the book. Thanks for sharing your honest thoughts. Interesting that the story is always cloaked in darkness in some way.